No 8 in the series – ‘His Bloody Project’ by Graeme Macrae Burnet meets a fleam. This vet’s blood-letting instrument is from the Museum’s Early farming collection and seems an appropriate match to what must be one of the messiest covers in crime fiction. 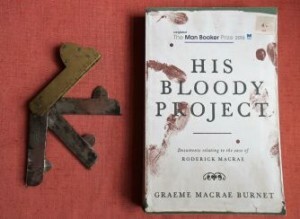 ‘His Bloody Project’ won the Saltire Fiction Award and was shortlisted for the Man Booker Prize. Graeme Macrae Burnet will be in Rothesay Library on Friday August 3rd and Print Point on Saturday August 4th.